The 6th annual Art Outside will take place once again at the beautiful Apache Pass festival grounds near Rockdale, Texas this October. The site features hundreds of acres of grassy camping areas and lush pecan trees scattered throughout. There will be facilities for showering, bathrooms, potable water, communal commons, and access to charging stations for your various electronic devices. We are bringing you some of the coolest art we have been able to find from all across the country. From interactive fire sculptures and flaming carnival games to kinetic solar sculptures to deeep two dimensional works by illustrators and painters leading movements on the east and west coast as well as here on the thrid coast of Texas! This is the place to see it all and to have a chance to interact with all of the amazing folks that come together to make it all possible. We are also partnering with MG Fest this year to bring you the cutting edge in motion graphics, projection visuals, and video mapping. We are very excited to showcase the works of the artists leading the new media art movement from around the world. You will find yourself a member of a growing community of creative individuals who share similar outlooks and are eager to expand their horizons. We believe in creativity, self expression, compassion, knowledge, and love. We are excited for you to join us in this celebration of art and community! Music at Art Outside 2010We are bringing in musical acts that span a wide range of genres including a plethora of electronic styles, gypsy folk, psyche rock, hip-hop, world fusion, and more. Art Outside is a 3-Day camping festival so come prepared for an extended stay. Bring a tent, plenty of your own water, food, clothing, towels, soap, toothbrush, etc. etc. You know the drill! 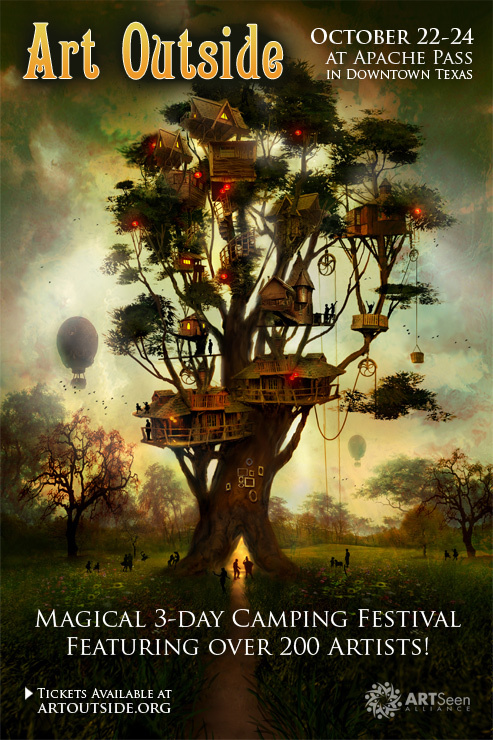 This year we have moved camping to reside right next the the festival area so you will be right there amidst all of the magical happenings that will be taking place. We are also allowing car camping this year but in order to maintain the camping space we have alloted, we are asking car campers to locate themselves seaperately from the main area. Please keep this in mind as you make plans to camp with friends. The Art Marketplace will be hosted under a 2000+ square foot pavilion that will provide a comfortable, shaded, and sheltered area where art goods will be exchanged. The Art Marketplace is an opportunity for artisans to showcase their wares to the patrons of the festival. We are excited to bring you a vibrant and bustling marketplace full of the most unique and precious items. At Art Outside there is never a dull moment. We are pleased to bring you some of the most interesting and engaging programming possible. From early morning yoga sessions to art workshops to open forum sessions on sustainability - we will be sure to tickle your fancy in every way possible. Our workshops, art gallery, yoga studio, rest areas, lounge, and bar will be covered by tent structures to provide shade and comfort while officially remaining OUTSIDE.